Ultimate Ears have made some great portable speakers — the Boom, the Megaboom 2, and added to the team is its latest, the Wonderboom. The Wonderboom is smaller than its predecessors, but it still packs a big, bass-rich sound. It is 102mm high, 140mm wide, 93.5mm in diameter, and weighs 425 grams. From its two 40 mm active drivers and two 46.1 mm x 65.2 mm passive radiators it will pump out 86 dBC. Just as has its bigger brothers, the big + and – symbols are the volume controls, on top of their working as a design element. On top are the power button, Bluetooth pairing button, and the ‘UE’ letters are the play, pause, and skip buttons. The Wonderboom’s rechargeable lithium-ion battery provides up to 10 hours play time, and will reach a full charge in just under 3 hours. It is IPX7 rated, so if you really must test it out, or you drop the speaker in water and are forgetful, it will be OK in up to one metre for up to 30 minutes. 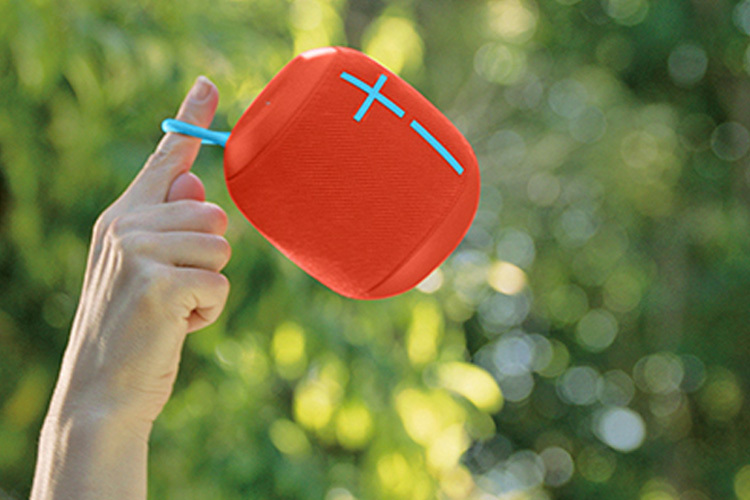 That rating also makes the Wonderboom drop-proof up to 1.5 metres. One Wonderboom can connect with another one, and from the one music source you can pair the two speakers for a bigger sound. It will pair with and play music from your various devices from up to 33 metres away. Last but not least, that small loop you can see on the top of the speaker allows you to attach the speaker to bags, furniture, or whatever. The Wonderboom is available now, in six colours: grey, black, red, blue, pink, and lilac. The price is $129 RRP. Buy the Wonderboom online now, at Amazon. Hello Scott. Good article, keep them coming! Thank you Oli, and thanks for reading!